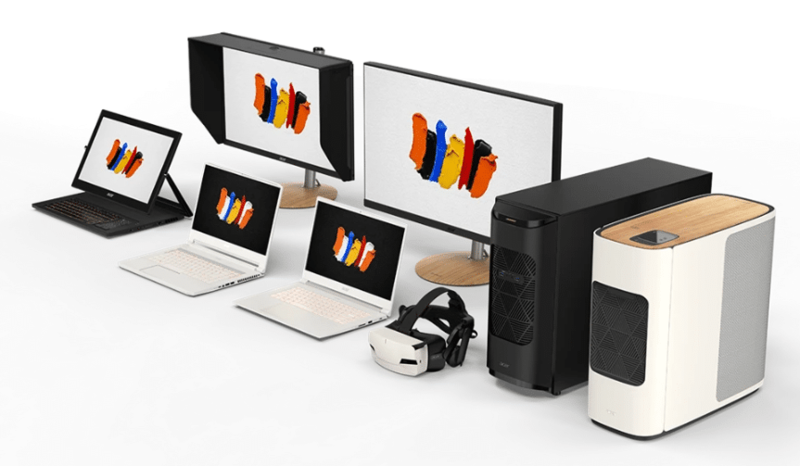 The ConceptD 900 and 500 high-end desktops feature up to NVIDIA Quadro RTX 6000 GPUs, enabling high-end visual effects rendering, complex 3D modeling, simulations, as well as AI and deep learning development. The high core count brings load times down and multitasking to the extreme while achieving enterprise-class reliability, stability, and security. NVIDIA’s latest Creator Ready Drivers bring enhanced app support and performance for studio applications such as Autodesk Arnold, Unreal Engine and REDCINE-X PRO, accelerating creator workflows for video editors, graphics designers, animators and 3D artists, photographers and broadcasters alike. The ConceptD 900 is a high-performance desktop for professionals running multiple complex and demanding applications. Featuring dual Intel Xeon Gold 6148 processors with up to 40 cores, and 80 threads, an NVIDIA Quadro RTX 6000 GPU, and 12 memory slots for a total of up to 192GB of ECC memory; it’s perfect for filmmakers, animators, product designers, and architects to get lost in the creative process without worrying about long render times. The ConceptD 900 is also ideal for AI and deep learning developers that need outstanding computing and graphics power. Creative professionals can work with more flexibility with up to two onboard M.2 PCIe slots, plus the efficient chassis design holds up to five storage bays with RAID 0/1-capable drives. Users can expand with extra onboard three PCIe x8 and four PCIe x16 slots. The ConceptD 500 is a powerful desktop for filmmakers, animators, product designers, and creators who want to bring their work to the professional level. It features up to 9th Gen Intel Core processors and up to NVIDIA Quadro RTX 4000 GPUs to make workloads and multi-media creation smoother and faster on complex projects so users can focus on the creative process. Powered by the latest 9th Gen Intel Core i9-9900K processor with 8 cores, 16 threads and reaching up to 5GHz, creator tools and projects run faster, smoother, and more stably on the ConceptD 500. Its multiple CPU cores achieve high single-core speed while staying cool with low heat output and low power consumption. With up to NVIDIA Quadro RTX 4000 GPUs, it supports four 5K displays (5120×2880 @ 60Hz) with HDR color, making visual effects, motion graphics, and animation rendering a breeze. ConceptD 9, 7, and 5 creator notebooks feature the ConceptD timeless design, and 4K UHD IPS PANTONE Validated displays. Covering 100 percent of the Adobe RGB color gamut, creators can be sure that their colors are as accurate as possible. With a wide color gamut, displays achieve an impressive color accuracy of as low as Delta E <1. These creator notebooks stay quiet with Acer’s 4th gen AeroBlade 3D Fan with a noise reduction mechanism that emits less than 40 db of noise — equivalent to the sound level of a library — while maintaining high computing and graphics performance. The ConceptD 9 is a creator notebook in an innovative form factor. Featuring Acer’s CNC-machined Ezel Aero Hinge, the 7.3-inch Ultra HD (3840 x 2160) display flips, extends, or reclines, for multiple usage modes. The display is PANTONE Validated and covers 100 percent of the Adobe RGB color gamut with unparalleled Delta E <1 color accuracy. Users can unleash creativity on any one of the usage modes, including display, Ezel, notebook, and stand modes, for sharing, gaming, working, and drawing. It features a Wacom EMR stylus that magnetically attaches to the ConceptD 9, to create an authentic writing and sketching experience. The stylus delivers unsurpassed usability and fast, accurate control with 4,096 levels of pressure sensitivity, so creators can design from scratch, take notes, or highlight key areas during concept discussions. Ports include a Thunderbolt 3 and MiniDP ports for connecting up to three external displays, and features Killer DoubleShot Pro for a strong and reliable WiFi connection. Graphic design is quick and easy on the ConceptD 5 laptop. Users can fine-tune images with professional precision and complete the trickiest 2D graphic design projects in no time with its powerful 8th Gen Intel Core i7 processor with Radeon RX Vega M GL graphics. It’s slim and light, with a modern design that looks great in any workplace, or for working on the go. It features a premium metal chassis with a magnesium-aluminum alloy on top and a palm rest area and a magnesium-lithium alloy on the bottom. Weighing just 1.5 kg (3.30 lbs. ), and measuring 16.9 mm thin (0.67 inches), it has a 6.22 mm (0.24 inches) narrow bezel with an 80 percent screen-to-body ratio. The ConceptD CM7321K is a 32-inch monitor ideal for 2D creators. Its VESA-Certified DisplayHDR 1000, 32-inch 4K UHD display delivers 1152 zones of local-dimming with Mini LED technology and DisplayHDR 1000, plus 99 percent coverage of the Adobe RGB color space and 89.5 percent Rec.2020 so creators and filmmakers can bring their ideas to life.